The DevOps second way is about creating feedback loops. My Standard+Case model introduces a really cool feedback loop that continues to delight me every time I see it. One of the primary objectives of processes and IT Operations is to try to standardise our world. This loop does it for us. 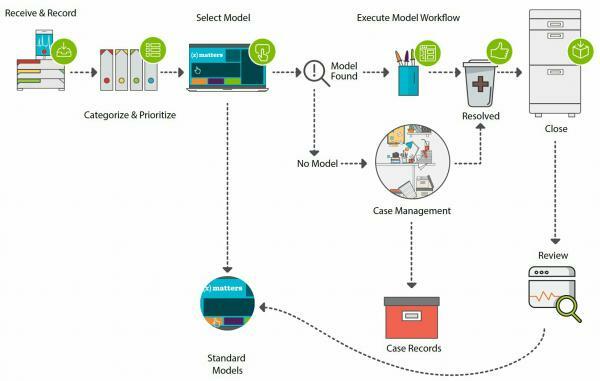 Case reviews create a self-adapting system so that process stays current with some of the changes in our environment by creating and capturing best workflows for new standard types of response, e.g. provisioning users to a previously unknown system, or resetting a new type of handheld device. We standardise our process models for known response types. As the world changes, suddenly we get new kinds of exceptions. Case Management deals with the exceptions. The review process captures repeat exceptions and learns new known situations which we standardise and then feed back into the knowledgebase, so that they will be handled as Standard models in future not Cases, thereby adapting to the changing environment. For full explanation of this model see my recent white paper on Standard+Case and if that interests you enough then of course see my book on the subject.